Lots of creativity to immerse myself in lately. I spent a couple of hours stitching on National Stitch Day and made some lovely sunglasses cases. The sun has shown itself this summer and they will be useful on our holiday. The pattern/instructions came from Debbie Shore’s magazine ‘Sew Inspired’. I used patterned fabric with felt on the inside. I then stitched with free-hand machine embroidery around some of the images on the fabric. I used a contrasting colour so the pattern can be seen on the inside. 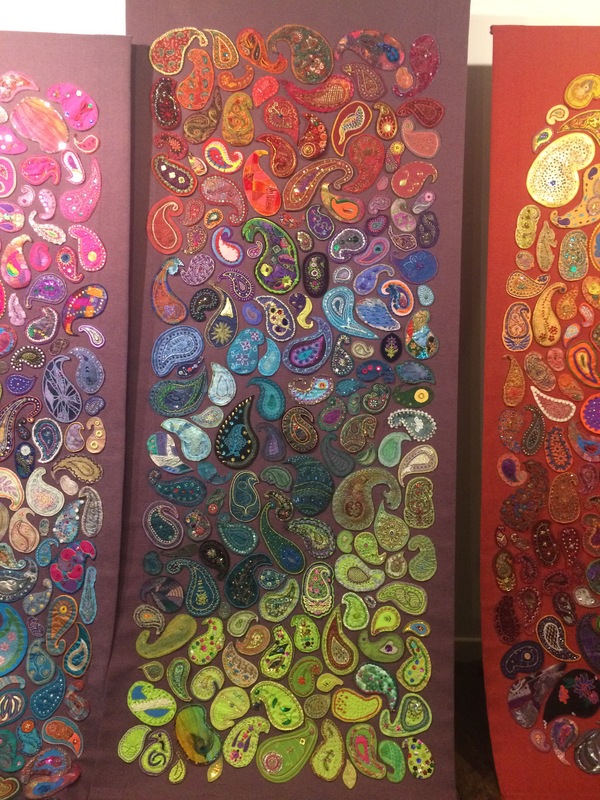 I also had a trip out to see ‘The Paisley Project’ exhibition at Farfield Mill. The panels are even more beautiful in person and the colours were gorgeous. Such a simple idea and so effective. 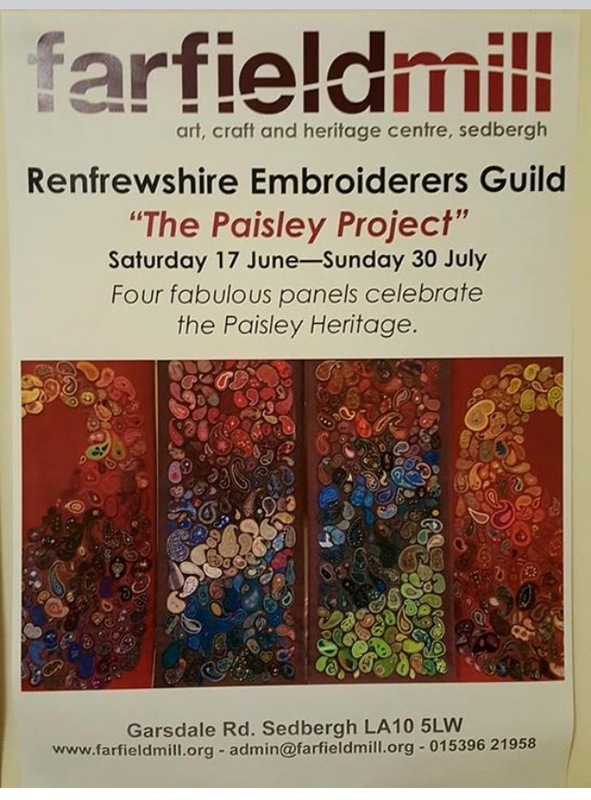 It was wonderful to see the pieces by the young members incorporated into the panels with pieces by more experienced stitches. 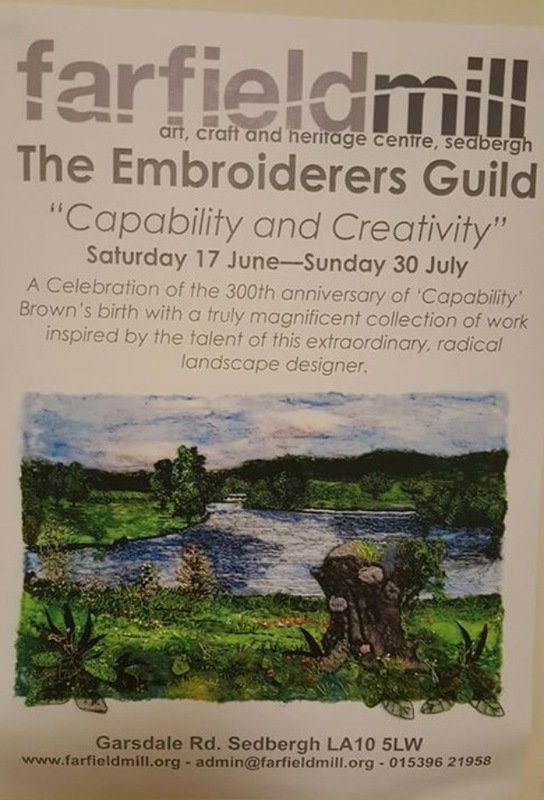 Whilst I was there I was lucky enough to catch the ‘Capability and Creativity’ exhibition by the Embroiders Guild and again I was inspired and wowed by the fantastic pieces on show. It is well worth trying to catch either exhibition if it is on show elsewhere. Farfield Mill is a beautiful place to visit with a shop, cafe and a number of talented crafts people working and selling their items there. There is also a museum on weaving which unfortunately I didn’t get time to look at. A place worth a visit if you are passing or want a day out. 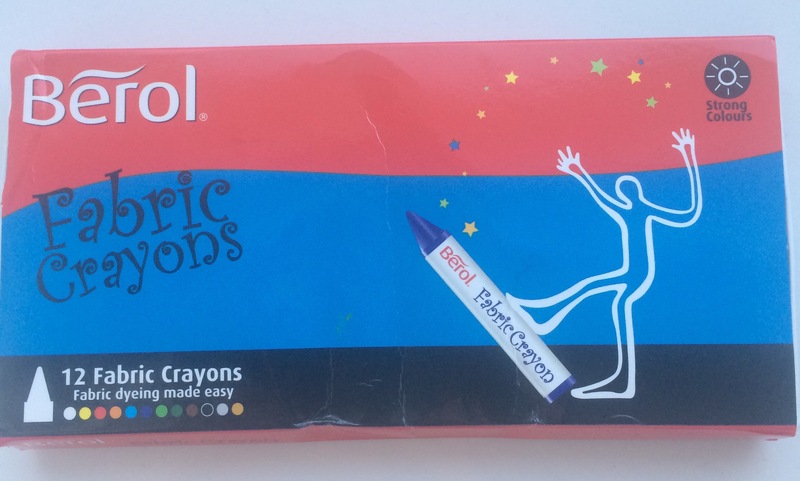 I’m also excited to have some fabric crayons. Stitch magazine has an article on producing an embroidered piece where fabric crayons are melted to provide a background for stitching. Can’t wait to experiment……. As it’s the school holidays and routine is out of the window I haven’t been meditating as regularly. As my anxiety is still up and down I need to get back to meditating twice a day. Something is setting my anxiety off and I can’t work out what it is. I keep having dreams where I wake up all anxious. Need to clear my mind before bed as being tired makes me more anxious. It’s all vicious circle and I need to break it! Starting yoga so hoping that will help too.